CHALLENGED with writing a history of Edmund Rice College, it would be hard for an outsider to know where to begin. But for anyone who knows the school there can only be one starting point – and that is at the door of Paddy McMeekin. 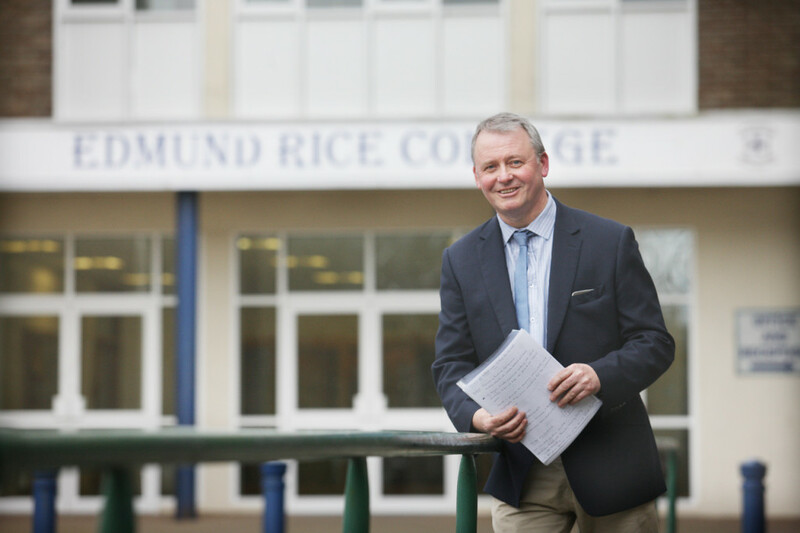 In many ways Paddy’s personal story is the story of North Belfast, but importantly for Edmund Rice College, he is someone who provides the continuity that has seen the school operate on three sites over 100 years and gives it a family bond few establishments can match. Paddy, one of the longest serving teachers at the school, has spent his working life within its walls in Glengormley, rising to the role of acting principal. But before that he was a pupil who formed part of the last intake of the old Hardinge Street, before they left the New Lodge for good. Paddy’s last act as a student was to help move the desks from the Antrim Road to the brand new Hightown Road CBS 40 years ago – and 36 years later he rose to the top post. Born near Carlisle Circus, like many others the Troubles were to land on his doorstep. “I was born in 1959 in Carlisle Street at Carlisle Circus and in August ’69 we lost our home in the Troubles,” Paddy recalls. “Like a lot of others that weekend, we had to leave our house the night before, my mother, my grandmother and myself. I remember we had to go to the Recy and that weekend – the Friday night and Saturday night – we slept on floors with dozens upon dozens of other people. We didn’t know what was going on because of the sectarian stuff. “August 15 or 16 my mother got a call and we went to Carlisle Street which had been a mixed community but we got called because the house was in flames. A pupil at St Patrick’s Primary School at the time, it was in September 1971 that Paddy’s long association with Edmund Rice College would begin. “At that time school was the last thing on my mind. I had failed my 11-Plus and it was a situation where my mother wanted the best for me and was determined to get me into Hardinge Street. “At the time it only took in 40 to 50 students a year but it had a fantastic reputation. It opened in 1903 and it was a technical college and the Brothers opened it on the same site I went to so at that stage they had been on the New Lodge for 70 years. The curriculum at the time was unlike other similar schools. “Compared to now, where all schools do technical design and crafts and so on, it was ahead of its time. The main compulsory subject you had to do up until O-Level was technical drawing and that had produced a huge number of architects and people like that who came through the ranks and went on to work in the north and further afield. “Places like Hardinge Street gave the Catholic population a chance to build skills for the workplace to get apprenticeships which were hard to get at the time. But it was more than that. It had a reputation for building you up educationally, from numeracy to literacy, and was very much into its languages even then. What I liked about it was although it was hard to get into the Brothers made sure it was open to everyone no matter what range of ability or social class. You had lads coming from various backgrounds, from people who would now be seen as very well off right down to kids who had nothing. Shifting populations and large-scale redevelopments in Belfast saw the Brothers embark on a move away from their home on the New Lodge, and how they dealt with that at a very difficult time reflects great credit on them, according to Paddy. “The brothers had been pushing for a new build from the 1960s but it was never realised. At the same time communities were spreading out from the city centre towards Glengormley, which at that time wasn’t much more than a village. “The Brothers wanted to push out because more and more boys were coming from further afield but also the Troubles were affecting the inner city. “When I joined in 1971 some of my first memories were soldiers putting boys in their uniforms up against the wall to be searched. That was par for the course in the 1970s. I was there until the following Easter when we moved up to the Park Lodge site. Paddy’s was struck by the teachers’ concern for the pupils. “Mr Cole was an elderly teacher at the time and was close to retirement. He was Scottish and had served in the Second World War and I can remember him going out to a Scottish regiment to tell them he was a former soldier and he was telling them to keep us safe as we left the school. Broadening horizons – something central to Edmund Rice College’s current curriculum – was in evidence even in the 1970s. At the time, the Hightown Road might as well have been the Gaeltacht, such was the culture shock after the New Lodge. “The Hightown Road was a rural environment, even though we are only around five miles from Carlisle Circus. Paddy was to leave the school to try a number of other paths, but after A-Levels his mind turned to teaching and he was welcomed back to his alma mater to train. “I came in as a trainee before getting the job as history and business studies teacher. From there I moved on to senior management and when former principal Kevin Gough stepped down I spent time as acting principal. Now head of pastoral care, Paddy says he looks back on his career with a great deal of happiness. “I’ve had to make choices and have been offered opportunities but I think I’ve made the right choice because I am in a school I feel a great deal of affection for and loyalty to, doing a job that is so productive. “The Brothers, without me knowing it, looked after myself and other lads in a number of different ways. Whether through funding issues to help lads go away on breaks if they’d heard of situations going on at home, it was support in a quiet, non-intrusive way. “They did all they could to get me to do A-Levels and encouraged me but even though I went out to work I came back and they must have engrained something in me. The attributes Paddy says he recognised in the teacher who tackled the British soldiers over the safety of the boys is something he says has been maintained throughout the years. As head of pastoral care he says it is as important then as it is now. “As much as we want them to attain their academic potential the foundation is that they are safe and happy. We are not perfect and we are constantly on the lookout for improvement but one of my proudest moments was the Department of Education report in 2011. “The pastoral care got an outstanding mark which is the highest grading. I was so very proud of that, not so much on an individual basis as head of pastoral care, but for the school itself. It was a reflection not just on the teaching staff but on auxiliary staff and everyone who goes out of their way to help kids. The introduction of girls to the roll in September is something Paddy says he welcomes wholeheartedly. “For me personally it’s something I’ve always advocated. In the Glengormley area we have St Bernard’s, St Mary’s and St MacNissi’s which are all co-ed primary schools. Where I came from it was boys or girls until the 1990s. I could never understand why we had girls going one way and boys the other after P7. It’s the most natural thing to come up together and there are huge benefits in being educated together. “I think there’ll be so many positives but we have to prepare ourselves for that. It will be a new experience for me but we will adapt and adjust. The staff is around 50/50 male and female that will help girls be more comfortable. To mark the 40th anniversary Edmund Rice College will hold a gala dinner at the Culloden Hotel in September. Tickets are on sale now from the school, just call 90 848433.